which consists of VMware ESXi™ and VMware vCenter™ Server. The course is based on ESXi 6 and vCenter Server 6. 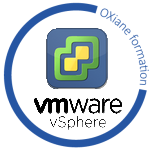 Completion of this course satisfies the prerequisite for taking the VMware® Certified Professional 6 exam.